“They stated that while they felt distressed they did not feel that they were going to perish in the next 24 hours,” said Lt. Cmdr. Scott Carr, a Coast Guard spokesman. In a Navy video, Ms. Appel said that the pair left Honolulu for an approximately six-month journey on May 3, encountering, on the first night, a fierce storm that lasted for three days. Weather records, however, contradict that claim. No organized thunderstorms moved through the area at the time, said Charlie Woodrum, a National Weather Service meteorologist based in Honolulu. There was a small-craft advisory in the area, he said, but it warned only of wind speeds below 35 miles per hour. Ms. Appel said that they had faced a “force 11” storm, which would have carried winds of 64 to 72 miles per hour. “In May, a force 11 storm is extremely rare,” Mr. Woodrum said. The women defended their account on Tuesday to The Associated Press, even after it pointed out those inconsistencies. The A.P. 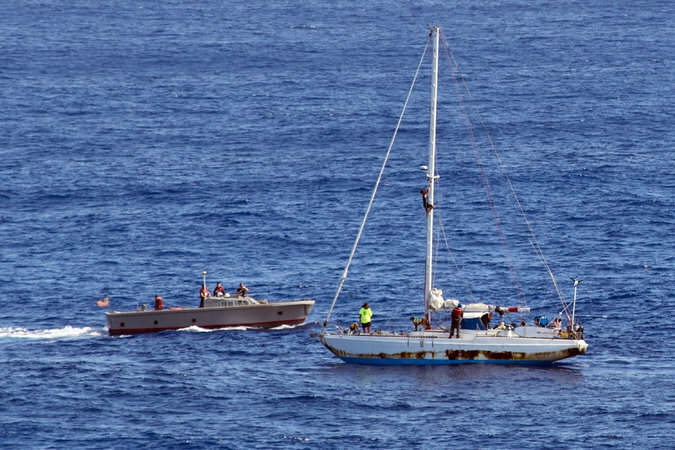 also raised doubts about the women’s claims that their boat would not fit in some Hawaiian harbors, which it noted were frequented by larger vessels. The women also described a couple of disturbing shark attacks. At one point, a group of five tiger sharks 20 to 30 feet long attacked their boat at night to teach two younger sharks how to hunt, Ms. Appel said on a call with reporters last week. In an interview with “Inside Edition” last week, she recalled a group of sharks observing her and Ms. Fuiava for a week before attacking. But there is little credibility to those descriptions, said George Burgess, the director emeritus of the Florida Program for Shark Research at the Florida Museum of Natural History. Tiger sharks are not social, do not teach their young in that way and have never been known to grow that large, he said. When asked, Mr. Burgess added that it was also unlikely that the women were describing another type of shark. “The only one that fits that pattern was the star of the movie ‘Jaws,’” he said. Many people familiar with sailing immediately voiced doubts online about the ordeal the women described. Among them was Linus Wilson, a professor of finance at the University of Louisiana who blogs about sailing and has written books about his experience sailing around various parts of the world. “It just does not seem believable that if you had a boat with a mast upright, and Ms. Appel said they could sail 4 to 5 knots, that they could not reach land,” he said. The women debarked the Navy ship that rescued them on Monday in Okinawa, Japan. Attempts to reach the women by telephone on Wednesday either went unanswered or to numbers no longer associated with them.